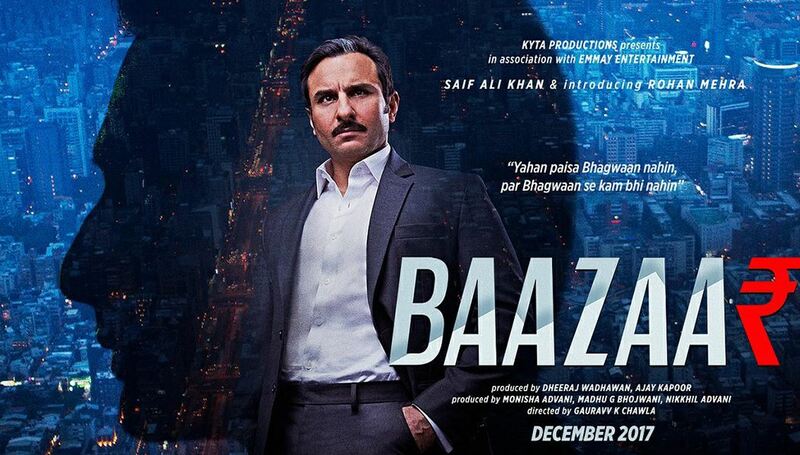 Baazar Movie Cast, Crew and Story: The movie Baazar is setting in the backdrop of a Money, Power, and Business. It is primarily on the Stock market. Saif Ali Khan is an actor. Saif’s films such as Parampara, Yeh Dillagi, Main Khiladi Tu Anari, Hum Saath-Saath Hain, Dil Chahta Hai, Kal Ho Naa Ho, Hum Tum, Parineeta, Omkara, Kurbaan, Love Aaj Kal, Race and Cocktail. Radhika Apte is an actress. She is well known for the movies such as Vaah Life Ho Toh Aisi, Kabali, Phobia, Parched, Kaun Kitne Paani Mein, Hunterrr, Haram, Badlapur, Vetri Selvan, Legend, All in All, Azhagu Raja, Rupkatha Noy and Baazar. Chitrangada Singh is an actress. She acted in the films such as Munna Michael, Gabbar is Back, Anjaan, Kirchiyaan, Inkaar, Joker, Desi Boyz, Yeh Saali Zindagi, Hazaaron Khwaishein Aisi, Kirchiyaan, Desi Boyz and Baazar. Denzil Smith is an Actor and Producer. Smith’s movies such as Brahman Naman, Bombay Velvet, The Second Best Exotic Marigold Hotel, The Lunchbox, Frozen, Ek Ajnabee, Jagga Jasoos, Baadshaho, Mumbai Salsa, Ek Ajnabee, Paap, and Baazar. Rohan Mehra is an Actor and a Model. He is well known for the films such as Sasural Simar Ka, Bigg Boss 10, Yeh Rishta Kya Kehlata Hai, Yeh Hai Aashiqui, Bade Achhe Lagte Hain, Gumrah End of Innocence and Baazar. Gaurav K. Chawla is a Director and a Writer. Gaurav’s films such as Bluffmaster, Dum Maaro Dum, P.O.W. Bandi Yuddh Ke, Jhoom Barabar Jhoom, Patiala House and Baazar. Nikhil Advani is a Producer. Nikhil’s films such as Lucknow Central, Airlift, Katti Batti, D-Day, Jaane Kahan Se Aayi Hai and Baazar. Amaal Mallik is a music composer. Amaal’s movies such as Golmaal Again, Chef, Mubarakan, Badrinath Ki Dulhania, Baar Baar Dekho, M.S. Dhoni The Untold Story, Do Lafzon Ki Kahani, Sarbjit, Azhar, Baaghi, Sanam Re, Mastizaade, Airlift, and Baazar.